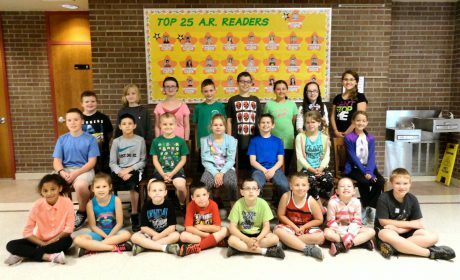 As the 2015-2016 school year draws to a close, Granby Elementary School recently honored its top readers. These students have worked hard throughout the year and received recognition as the top 25 point earners in Granby’s Accelerated Reader Program. The students were treated to a special breakfast with the principal, received certificates and have their pictures featured on a bulletin board display in the main lobby. Granby’s outstanding readers are – front row, from left: Gionna Allen, Sophie Burtis, Gavin Lauckarn, Joseph Wardhaugh, Dominic Waring, Alex Collins, Rebecca Bartlett and Cody Romanowicz. In the middle row, from left: Kieran O’Hanlon, Anthony Hamel, Lucas Pike, Riley Lunn, Sutter Lewin, Reagan Lunn and Harper Ells. In the top row, from left; Johnny Hutchins, Maddison Weldin, Erica DeSalvatore, Ethan Demars, Simon Bradshaw, Olivia Metcalf, Grady Marshall and Elle Stafford. Absent from photo: Kallen Roberts and Tina Teeter.